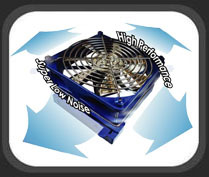 Titan has been around since 1989, manufacturing many different cooling products. 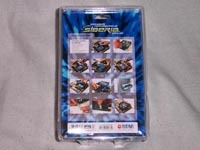 Their products include heat sink and fan combos for video cards and processors, hard drive coolers, liquid coolers, fan speed controllers, and other cooling products. Some of these products are designed for the average user, while most of the others are designed with the true computer enthusiast in mind. 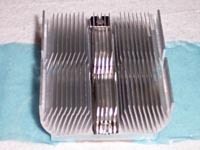 One of their newest items is the Siberia 12cm (120mm) heat sink/fan combo for Pentium 4 (sockets 478 & 775), AMD K7 Socket 468, and AMD K8 (Socket 754, 939, & 940). Today I will be taking a look at the AMD K8 model. 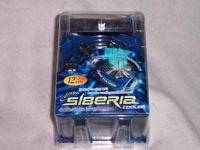 The Siberia comes packed in a sturdy plastic shell. 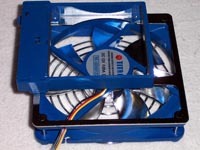 With the fan being 12cm the package is large enough to accommodate all the components. I found the packing to be more than sufficient, as nothing was able to move, even when I tried to make them. The instructions for installing this beast are built onto the back of the packaging. This not only uses space that is normally wasted, but also ensures you get a copy of the installation instructions. 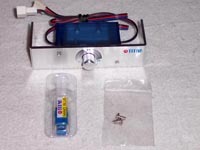 Included in the package are all the necessary components... Aluminum heat sink (with mirror finish copper base, shown later). 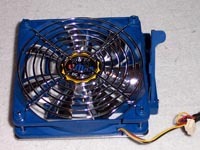 Blue 12cm Fan (with silver blades) and fan grill. If you look closely at this picture, you can see the lever used to connect the fan to the heat sink. Flipping the fan over, you can see the how the fan connects to the heat sink. When you push the lever down, it squeezes the fan base around the heat sink. This is cushioned by black non-slip rubber. Once I connected the fan to the heat sink, it was very difficult to pull it off without releasing the lever. This is truly a unique design. Finally we have the "value" added components, which include a silver brushed Aluminum fan controller, screws, and some Nano Blue thermal grease. Earlier I mentioned the "Mirror Finish" for the base of the heat sink. It really is a mirror finish! Looking at it, I could see my reflection as if I was looking in a mirror. The entire base has the mirror finish, not just the copper that touches the processor. While the base has an absolutely beautiful finish, you have to be careful not to drop the heat sink onto anything as it is very easy to scratch. 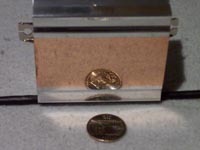 After taking these pictures, the heat sink fell over onto the quarter I was using for the reflection and left a mark in the finish. 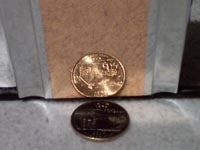 It wasn't a large mark, but you could see where the heat sink hit the quarter.